This Midwest Blue Oval Club returns to Kansas Speedway, as the beautiful facility will play host to Kansas City Blue Oval Rally! 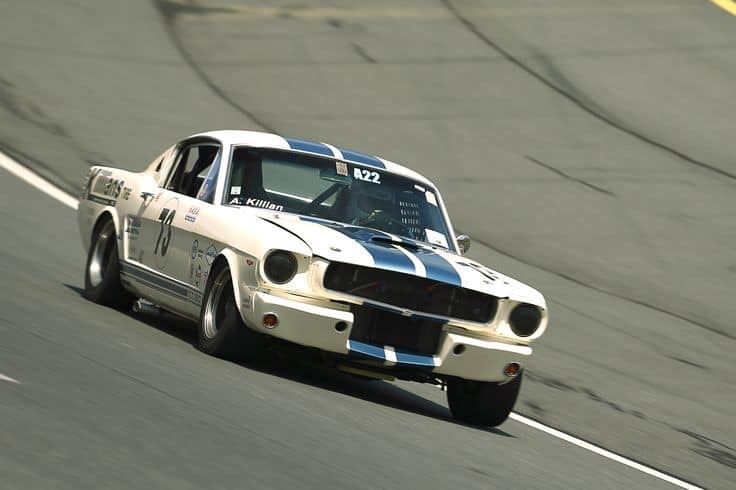 Just like last year, the 2015 event will be held in conjunction with the National Auto Sport Association (NASA) Central Region, and the Heartland Vintage Racing group. We’ll have a separate “corral” for our Fords, with separate registration. There’s no formal judging, just a few fun type awards picked by our sponsors. 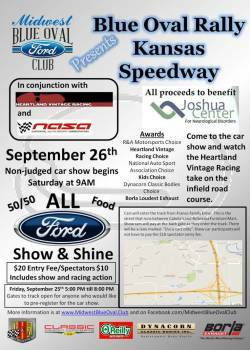 This show is just a casual gathering where you can hang out with your Ford friends and see lots of great FoMoCo rides while helping to raise money and awareness for the Joshua Center. Plus, you’ll also get to see vintage racing and sports car road racing going on simultaneously on the Kansas Speedway road course, which you can watch from viewing points in the infield. Bring chairs and your coolers with refreshments and food! If you’d like to get some track time yourself, there’s plenty of space left in the run groups, including the casual (and inexpensive) Hyperdrive introductory sessions, but you’ll need to register with NASA for that. More details to come! Friday, September 255:00 PM till 8:00 PM Gates to track open for anyone who would like to pre-register for car show. Saturday, September 26Car show registration will run from 9:00 AM till Noon. Cars will enter the track from France Family Drive. This is the street that runs between Cabela’s and Nebraska Furniture Mart. Show cars will pay at the back gate as they enter the track. There will be a lane marked “Show cars only”. Show car participants will not have to pay the $10 spectator entry fee. Special awards will be given out at 3:30 PM. Awards to be determined. The Joshua Center is a non-profit organization that provides services and support for the social, emotional, and educational needs of neurologically impaired children and their families, including children with Tourette Syndrome, Aspergers, High-Functioning Autism, Pervasive Developmental Disorder, Obsessive Compulsive Disorder and Sensory Processing Disorder. To read and learn more about the Joshua Center, click on their logo below. Directions: To get into the track you will drive directly into the infield. See the attached map in this post. Drive to Nebraska Furniture Mart and head south on France Family Drive past Sporting KC Arena to get into the event. If you entering into the car show we will have a person at the entry taking your money and giving you registration cards. 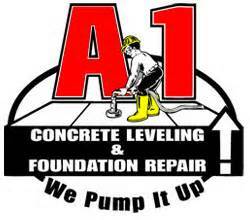 This will get you and your car and passengers into the event. Registration will be open Friday, Sept 25 from 5-8pm and Saturday, September 26 from 9am till noon. 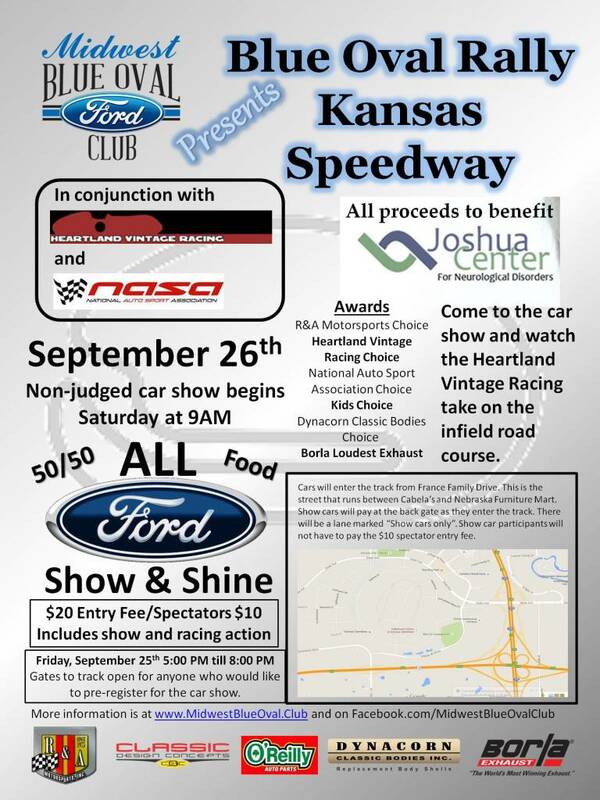 Car show is $20 to enter or $15 if you are a MBOC member with membership card. Lots of stuff! The Blue Oval Rally is a casual show & shine for Ford-powered vehicles only. Just a chance for cool Fords & Ford lovers to hang out together, and raise money for a worthy cause. No judging, no awards (although there are dash plaques for the first 125 cars). The racing portion is being handled by the NASA and Heartland Vintage Racing folks, which you can either watch or participate in (more info over to the right under the photo). There are a number of vintage & late model Fords scheduled to race! Blue Oval Rally Entry: $20.00 per car. Racing Entry: Varies per run group. See NASA Event page for info. Registration for the Blue Oval Rally takes place on the day of the event. For the track sessions you may pre-register or sign up day-of. Racing participants can also opt to come back and run on Sunday! All the action takes place within the track infield, including spectator parking. 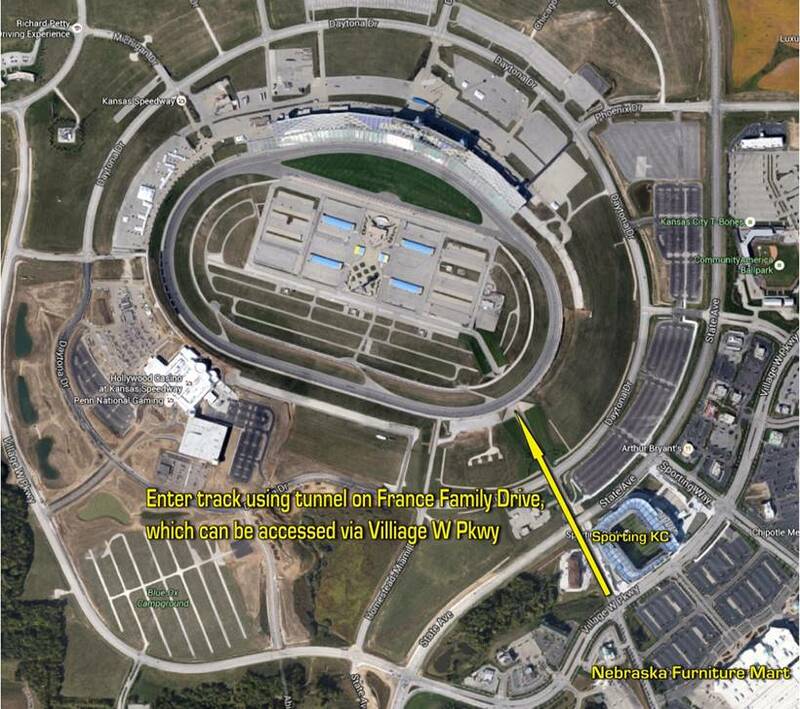 So you’ll need to enter the track using the infield tunnel, which is accessible via France Family Drive. See the track traffic maps for more information. DO bring your cooler, stocked with food, water & soft drinks. DO bring your chairs & tents. DON'T set up your tent anywhere but in the grass. No tents are allowed on any paved areas and all tents MUST be secured. It tends to be pretty windy at the Speedway. DO consider bringing a bicycle or golf cart. This is a big place. DON'T let ANY unlicensed driver operate ANY vehicle - bicycles and scooters included. Sorry, insurance won't allow it.